Dense Fog Advisories were issued over inland south Texas on the morning of Thursday 30 July (below). GOES-R IFR Probabilities of this event, above, capture the development of IFR conditions after 0700 UTC (2 AM CDT). Values are quite small until about 0900 UTC, as IFR conditions develop around Alice, TX and Orange Grove Naval Air Station (in Jim Wells County) and then expand. Comparing the GOES-R IFR Probability fields, above, and the GOES-13 Brightness Temperature Difference fields, below, suggest that the model component in the IFR Probability fields showed low-level saturation occurring a bit farther north than the initial strongest pixel returns in the Brightness Temperature Difference fields. For example, compare this toggle of GOES-R IFR Probability and GOES-13 Brightness Temperature Difference fields at 0800 UTC: Larger values of GOES-R IFR Probability (albeit still small — around 20%) are shifted north of the strongest enhancements in the 0800 Brightness Temperature Difference fields, which stronger enhancements are mostly near the Rio Grande). The toggle for 1000 UTC is here. FOG ADVISORY…WHICH IS IN EFFECT UNTIL 9 AM CDT THIS MORNING. UNSATURATED CONDITIONS NEAR THE SURFACE. * IMPACTS…DENSE FOG WILL RENDER DRIVING HAZARDOUS. South Texas had favorable geometry today that allowed for successive Suomi NPP overpasses to provide information. The Day Night Band imagery, below, and the Brightness Temperature Difference fields, below the Day Night Band, suggest few clouds are detected at 0727 UTC or at 0906 UTC. Northeast Florida also had reduced ceilings and visibilities on the morning of 30 July 2015. The animation above of GOES-R IFR Probabilities from 0700-1300 UTC (above) shows enhanced values in most of the inland northern Florida panhandle. The flat nature of the field suggests that higher clouds are preventing satellite detection of low clouds: predictors based on model fields only are being used to compute IFR Probabilities (that is, satellite predictors are not being used). The Brightness Temperature Difference animation for this event is below. This entry was posted in Deep South, Texas on July 30, 2015 by Scott Lindstrom. Regions of dense fog developed over the Midwest during the morning of July 27 2015, and the GOES-R IFR Probability fields are shown above for 1000 through 1215 UTC. There is a good spatial relationship to where IFR Probabilities are large(ish) and where IFR conditions are present. This example is a good reminder that GOES-R IFR Probability fields should be interpreted with knowledge of other fields. On this day, an extensive cirrus shield (Click the link to view the Brightness Temperature Difference field at 1000 UTC) prevented GOES-13 from viewing low clouds over much of the midwest; thus, the IFR Probability field was driven mostly by model fields over Illinois and Iowa. This is why the field there is mostly uniform. When satellite data is not used in computing the probabilities (because of cirrus clouds), the magnitude of the IFR Probability is reduced. This entry was posted in Midwest, Multiple Cloud Layers on July 27, 2015 by Scott Lindstrom. GOES-R IFR Probability fields computed using GOES-15 are periodically — once or twice per night — showing unusual behavior, as documented in the short animation above. The 0730 UTC shows a greatly expanded region of modest IFR Probability values compared to 0715 UTC; at 0745 UTC, fields return to ‘normal’. This aberrant behavior does not occur during the day, nor does it occur every night, nor at specific times. This intermittent type of error makes it difficult to determine and exact cause, but it appears to be related to GOES-15 3.9 µm emissivity. That field is missing when the erroneous fields are produced. This could be an issue of timing — that is, the algorithm requests the field before it is created. CIMSS scientists are actively working to determine the underlying cause of this error. Tweaks to the processing flow at CIMSS at the end of July appear to have fixed this problem, as it has not occurred in August. 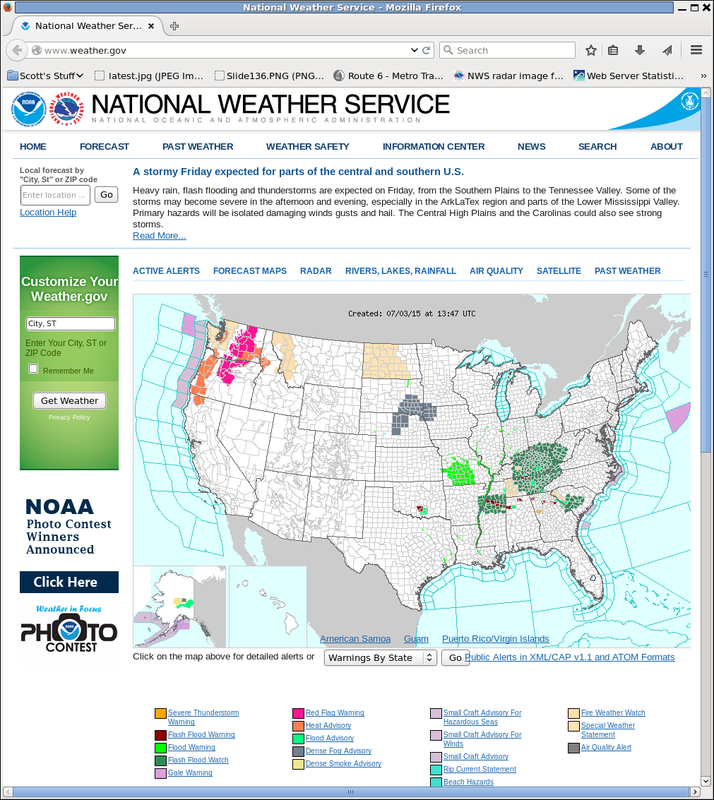 This entry was posted in Error Explanations, Pacific Northwest on July 21, 2015 by Scott Lindstrom. Dense fog developed over portions of eastern Iowa early in the morning of 20 July 2015. The animation above shows the hourly evolution of the GOES-R IFR Probability fields computed using satellite data from GOES-13 and Rapid Refresh model output. The flat nature of the fields in the animation above suggests the satellite data cannot view the near-surface because of higher level clouds; Brightness Temperature Difference fields, below, from 0615, 0800 and 1000 UTC confirm that hypothesis. This was a case where inclusion of the Rapid Refresh information was vital for the IFR Probability field to outline correctly the region of visibility restrictions due to fog. Note that the last GOES-based GOES-R IFR Probability image, at 1215 UTC, above, after sunrise, shows a general increase in values over the 1100 UTC image (just before sunrise). Daytime predictors (used here at 1215 UTC) result in a higher probability of IFR conditions that nighttime predictors (used here at 1100 UTC) in part because of the use of visible data for cloud-clearing. 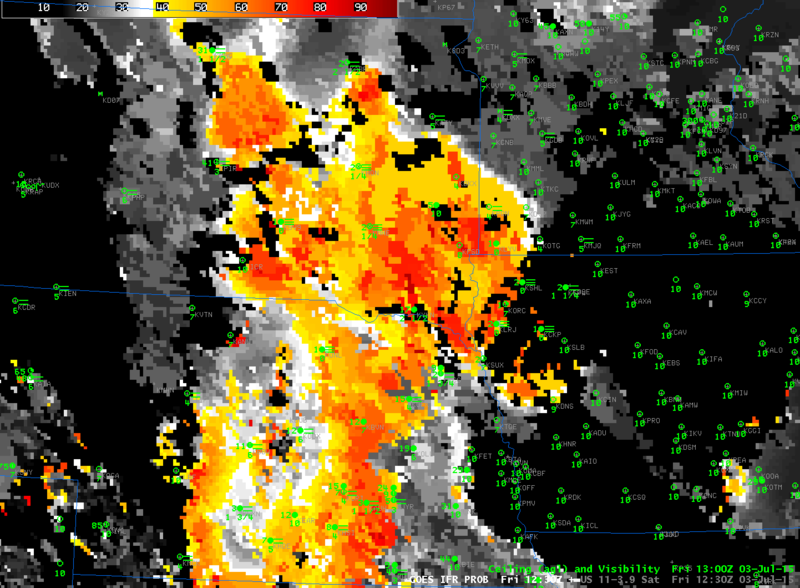 An Aqua overpass provided MODIS information at ~0830 UTC, and toggle between the brightness temperature difference field (11.0µm – 3.7µm) and MODIS-based IFR Probabilities, below, shows MODIS-based IFR Probabilities were enhanced over southern and eastern Iowa in a region where the brightness temperature difference field gave a signal consistent with mid- and high-level clouds. This entry was posted in Midwest, MODIS on July 20, 2015 by Scott Lindstrom. MODIS-based Brightness Temperature Difference fields, above, from 0547 (Terra) and 0958 (Aqua) detect a large area of marine stratus over the Pacific Ocean that is penetrating inland up river valleys along the coasts of Washington and Oregon. Dark reatures that are consistent with higher clouds are also present over southern Oregon. GOES-R IFR Probability fields can be computed from MODIS data, and those fields (below) show high probabilities along the coast, in regions where IFR or near-IFR conditions are observed. Aspects of the GOES-R IFR Probability field deserve comment. Where high clouds are present in the MODIS data, GOES-R IFR Probabilities are largely controlled by model-based fields that are typically smooth. This is the case over the northwest corner of the IFR Probability field, for example, and also off the southern Oregon coast at ~0550 UTC. The blocky nature of the IFR Probability fields off the central Oregon coast at ~0550 UTC is likely related to model relative humidity fields that show saturation both near the surface and aloft. Suomi NPP Day Night Band visible imagery had ample illumination early on 6 July with a waning gibbous moon. Imagery below from 1000 UTC (very close to the Aqua pass) also shows thin tendrils of fog moving up river valleys. The VIIRS instrument that provides the Day Night imagery is only on one satellite, however, (compared to MODIS on both Aqua and Terra) so such views are infrequent. MODIS and Suomi NPP imagery suggest fog is penetrating preferentially into river valleys along the west coast. This should color the interpretation of GOES-based GOES-R IFR Probabilities. GOES-15 lacks the horizontal resolution to resolve fully most river valleys (Rapid Refresh data, similarly, does not resolve small valleys); however, GOES-15 does have excellent temporal resolution, and combining that with the intermittent information from polar orbiters such as Terra, Aqua and Suomi-NPP provides a fuller picture of the evolution of near-surface IFR conditions. The animation of GOES-R IFR Probabilities from GOES-15 is shown below. This entry was posted in MODIS, Pacific Northwest, Suomi/NPP on July 6, 2015 by Scott Lindstrom. The Brightness Temperature Difference field is commonly used to detect low clouds in the atmosphere and to infer the presence of fog. At sunrise (and sunset), however, when the amount of reflected solar radiance with a wavelength of 3.9 µm is changing rapidly, features can be lost. For example, can you detect where the brightness temperature difference fields above relate to the observations of dense fog (Dense Fog Advisories were hoisted). 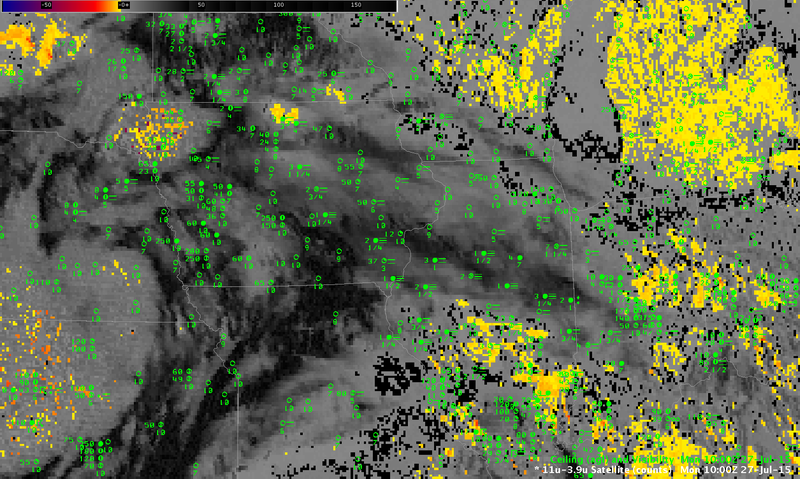 GOES-R IFR Probabilities are able to highlight regions of low clouds and fog through sunrise. The IFR Probability field for 1230 UTC on 3 July is shown below. It does a far better job of outlining the region of low clouds and fog. Animations of the fields, of course, play to the strength of GOES-13 temporal resolution and aid detection. GOES-R IFR Probabilities and Brightness Temperature Difference Field animations are available. This entry was posted in Day/Night Boundary on July 3, 2015 by Scott Lindstrom. The CIMSS Satellite Blog shows a case on July 2nd 2015 of Day Night Band detection of river valley fog over the upper midwest. 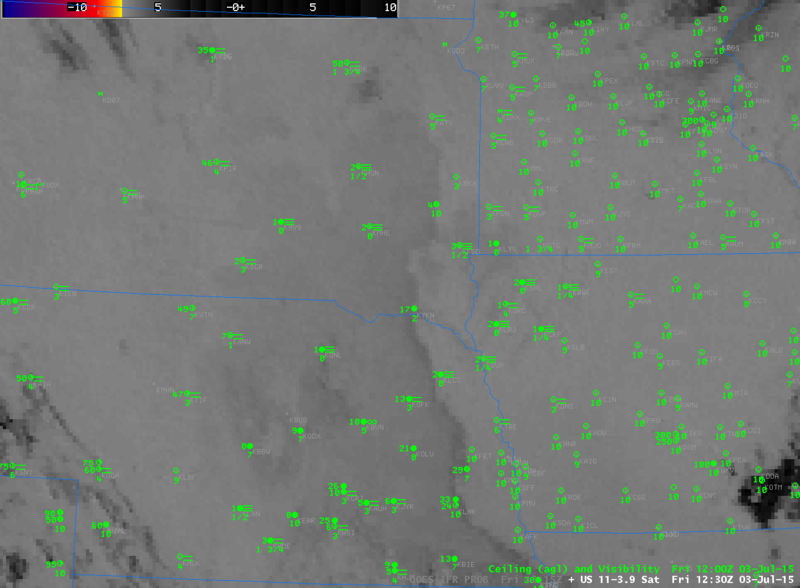 River Valley fog is a challenge for GOES detection because of the large pixel footprint. So how did it do in this case, and how does that compare to MODIS-based detection? The animation below shows the three MODIS scenes during fog development that occurred. MODIS-based IFR Probability at 0432 UTC (from Terra) hints at the development of fog over the Wisconsin and Kickapoo Rivers over southwestern WI. GOES-based IFR Probability from 0430 UTC (shown below the MODIS data) shows no signal there. GOES-based IFR Probabilities do appear at 0715 UTC, however. The MODIS-based signal has given any forecaster an early alert to the development of fog over the River valleys. (Toggles between GOES and MODIS-based IFR Probabilities are available for 0430 UTC, 0715 UTC and 0845 UTC). Note that both 0710 and 0848 UTC MODIS-based fields (from Aqua) have a geometry such that the Mississippi River valley is near the edge, and artifacts related to the so-called bow-tie effect are present as repeated features in the field. Nevertheless, the MODIS-based field correctly limits the fog to the River Valleys and shows very high IFR Probabilities; GOES-based pixels fail to resolve narrow river valleys. An animation of GOES-based IFR Probabilities, below, suggests that GOES data identified the likelihood of IFR conditions starting around 0515 UTC, almost 45 minutes after the higher-resolution MODIS pass at 0432 UTC. This entry was posted in Midwest, MODIS on July 2, 2015 by Scott Lindstrom.